The GRAS 45BB KEMAR has the same dimensions and acoustical properties as the original KEMAR, but has been developed further by GRAS to meet the industry’s demand for realistic measurements of hearing aids, headphones and headsets. It provides acoustic diffraction similar to that encountered around the median human head and torso, both in the proximity and in the far field. 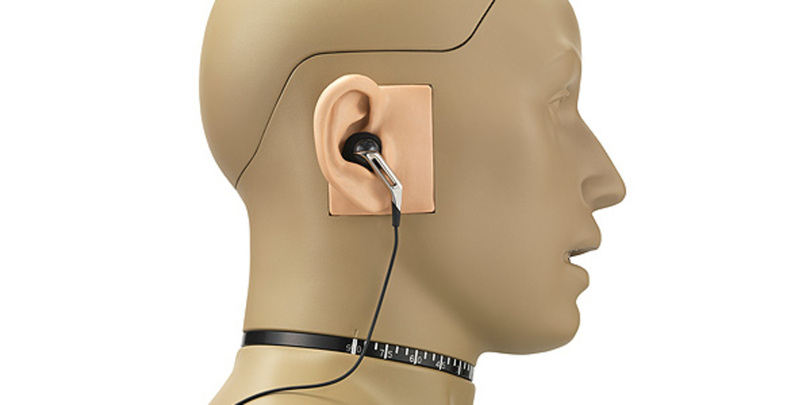 The 45BB-11 is a KEMAR head and torso for 1-channel low-noise test of ear and headphones. The main components of the 45BB-11 are the GRAS 43BB Low-noise Ear Simulator System and the KB5000/KB5001 anthropometric pinnae. The built-in microphone is the 40AH Low-noise Ext. Polarized Pressure Microphone which has a specially reduced noise floor in order to achieve a large dynamic range. Read more about the 43BB Low-noise Ear Simulator System here. The external shape of the pinna is identical to that of the standardized KEMAR pinna, but concha and ear canal have been modified so that they closely mimic the properties of a real human ear. The ear canal has been extended and is now an integral part of the pinna which seals directly against the ear simulator. Like the human ear, the ear canal has the 1st and 2nd bend, and the interface with the concha is oval. Fit and insertion consistency are much improved over the cylindrically or conically shaped ear canal extensions that are used with the standard pinna. In addition to the traditional push mounting from the outside, the pinna is secured with two screws from the inside of KEMAR's head. These two screw ensure that the pinna is held firmly in place. Therefore, it seals perfectly against the ear simulator and the head, and it is therefore possible to mount and dismount DUTs repeatedly without compromising the seal. Read more about the Anthropometric Pinnae here. 45BB-11 is configured to meet the consumer electronics industry's need for R&D testing of ear and headphones, including in-ear headphones with Active Noise Cancellation. The anatomical shape of the pinna makes it possible to achieve very good fit and sealing with anatomically shaped in-ear transducers. Controlling the insertion depth is easy, leading to good insertion consistency and highly improved repeatability and accuracy of measurements. The improved fit and seal also means that the low frequency response is improved. It will allow you to reproduce base notes, as well as effectively measure (active & passive) attenuation. Because it can measure down to and below the threshold of human hearing, it can measure the influence of the electronics on the audio response of the earphones. Its low noise floor means that measurement results will have a strong correlation with the subjective feedback from test persons and users. The low inherent noise of the system also means that THD and Rub & Buzz at very low levels can be investigated. For these reasons, the 45BB-11 KEMAR is ideal for accurate and repeatable testing of headphones, earphones and in-ear hearing protectors. Also, the improved collapsibility of the pinna makes it well suited for testing of supra-aural and circumaural headphones.